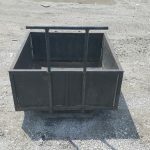 Solid Steel Bins come in various dimensions. 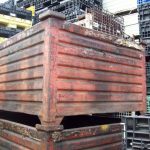 They’re used to transport manufactured parts from station to station within plants, and also to other facilities for assembly. 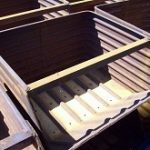 Some are manufactured with sheet metal sides and floors. 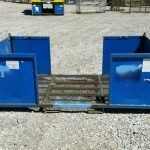 These usually have one or two half drop gates, which may be folded down to allow employees easy access to contents. 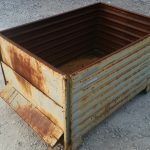 A second style of solid bins are the steel corrugated bins, which are constructed of corrugated steel. 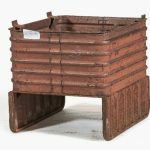 The corrugated steel adds extra strength and durability to these totes. 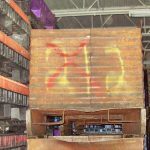 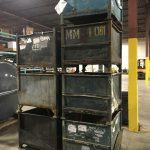 These containers are typically used to carry heavy hot metal parts and the corrugated steel helps prevent the steel bins from warping from the heat. 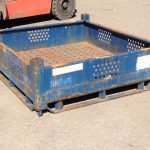 Both types of these solid steel bins may vary in their holding capacity. 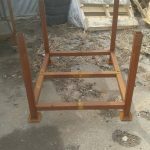 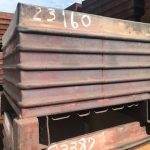 Their capacity is determined by the gauge of steel used when fabricating them, and also the content of the floor structure. 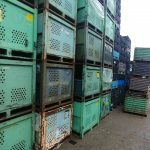 As with most bins, they are stackable. 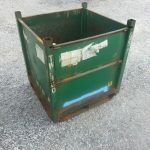 There is one other style of bin that has two hoops, one each on opposite sides of the bin, that extend above the top rail. 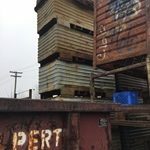 These hoops allow for a different type of stacking. 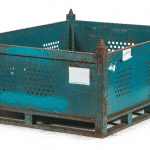 This type is referred to as “hairpin stacking” bins. 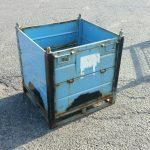 View Cart → "Item #880: Steel Vented Bins 72″ x 36″ x 26″ o/h, (18″ ID)." 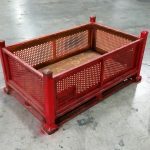 was successfully added to your cart. 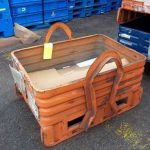 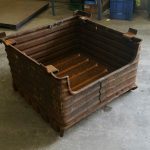 Item #918: Steel Bins, OD: 95.25″ x 47.5″ x 35.75″ o/h, ID: 93″ x 45.5″ x 28.25″ ID, opening on 95″ sides. 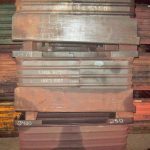 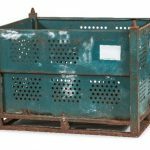 Item #916: Steel Bins, OD: 59.75″ x 47.75″ x 46″ o/h, ID: 57.25″ x 39.25″ x 36″ ID, 1 gate on 59″ side. 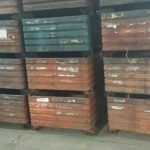 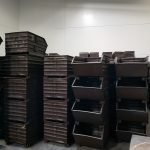 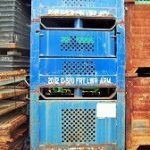 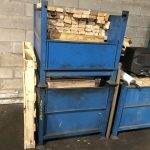 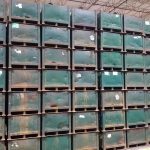 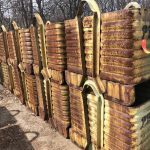 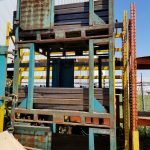 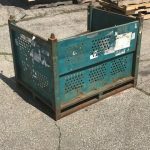 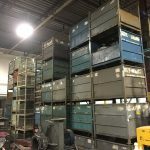 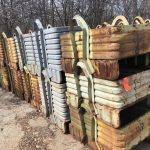 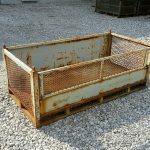 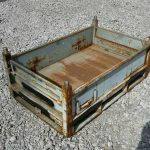 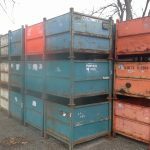 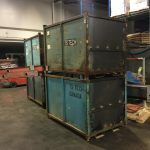 Item #908: Steel Bins, OD: 56.25″ x 48.5″ x 25.25″, ID: 53.75″ x 45.5″ x 16.5″ ID, 2 gates on 48″ sides. 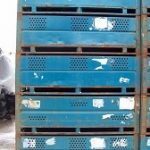 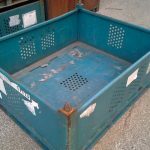 Item #900: Steel Perforated Bins, OD: 48″ x 29.75″ x 36″ o/h, ID: 44″ x 26″ x 26.25″ ID, 4 gates. 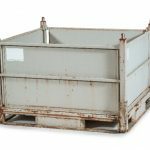 Item #880: Steel Vented Bins 72″ x 36″ x 26″ o/h, (18″ ID). 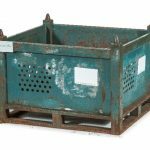 Item #884: Steel Flow-matic Corrugated Bins, 33″ x 36″ x 24″ o/h, (18″ ID). 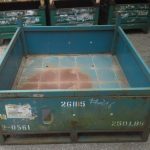 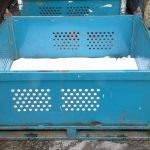 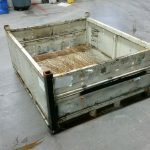 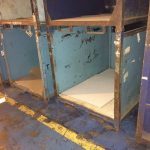 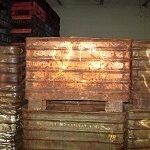 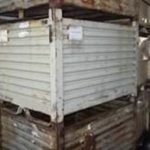 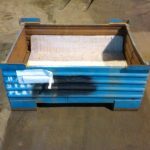 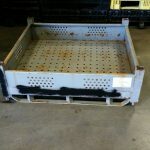 Item #883: Steel Hopper Bottom Bins for discharge of product, 33″ x 36″ x 24″ o/h, (18″ ID), stands are available. 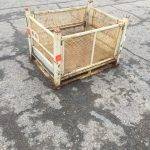 Item #865: Steel Bins Expanded Metal Sides, one gate, OD: 72.5″ x 36″ x 28″ o/h, ID: 72″ x 34″ x 19.5″ ID. 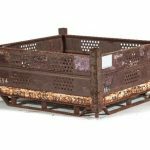 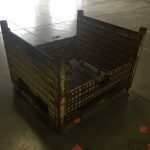 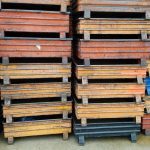 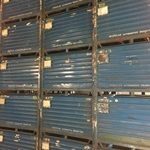 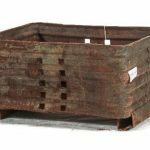 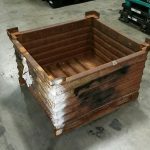 Item #863: Steel Corrugated Bins, No Gates, Solid Floors, OD: 63.5″ x 46.25″ x 34.25″ o/h, ID: 59.5″ x 43″ x 27″ ID. 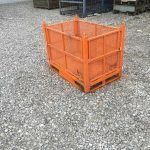 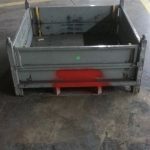 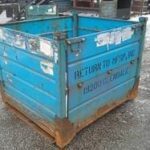 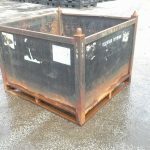 Item #860: Steel Vented Bins, No Gates, OD: 53″ x 48″ x 18″ o/h, ID: 52.25″ x 47.25″ x 10″ ID. 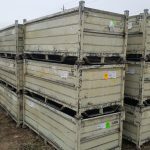 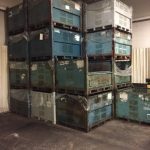 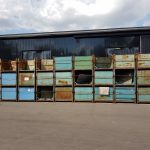 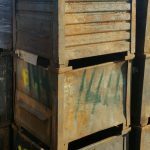 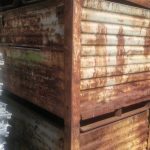 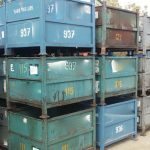 Item #857: Steel Corrugated Bins, Solid Floors, No Gates, OD: 49″ x 38″ x 19″ o/h, ID: 45″ x 35″ x 14″ ID. 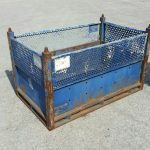 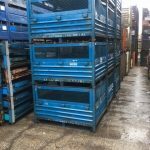 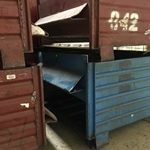 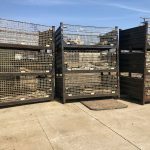 Item #856: Steel Bins, Mesh Floors, 2 gates on 48″ sides, OD: 48.5″ x 36.5″ x 34″ o/h, ID: 46″ x 33″ x 27″ ID. 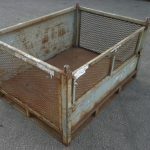 Item #855: Steel Perforated Bins (Solid Floors), No Gates, OD: 48″ x 30″ x 22.5″ o/h, ID: 45″ x 27″ x 14″ ID. 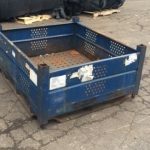 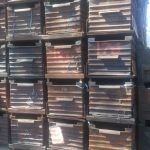 Item #854: Steel Bins, 2 gates on 30″ sides, OD 48″ x 30″ x 20.5″ o/h, ID: 44″ x 27.5″ x 9.5″ ID. 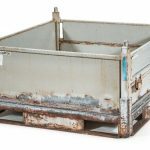 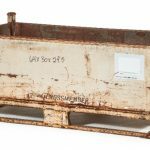 Item #844: Steel Drop Bottom Bins 49.25″ x 33.5″ x 31.25″ o/h (24.5″ ID). 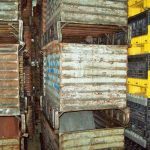 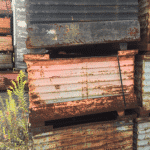 Item #842: Steel Corrugated Bins, 2 gates on 45″ end, 45″ x 48″ x 34″ o/h, (24″ ID). 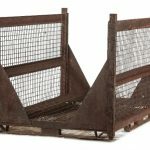 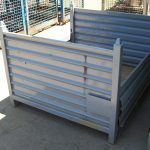 Item #841: Steel Vented Bins 32″ x 32″ x (18″ ID), 1 gate. 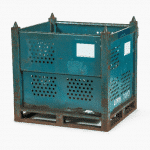 Item #840: Steel Collapsible Bins 48″ x 53″ x 34″ o/h. 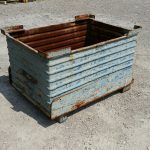 Item #839: Steel Corrugated Bins, with crane lifting lugs, 42″ x 59″ x 30″ o/h, (23″ ID). 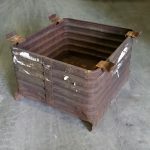 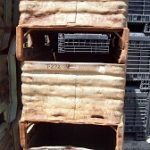 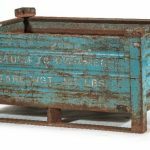 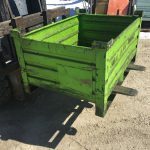 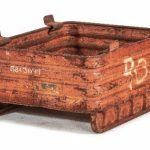 Item #838: Steel Corrugated Bins (Skid Bottom) 32″ x 39″ x 30″ o/h, (23″ ID). 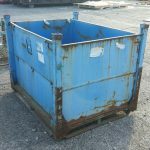 Item #837: Steel Tapered Bins 42″ wide x 36″ x (24″ ID). 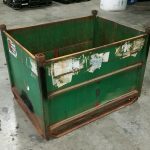 Item #836: Steel Vented Bins 36″ x 72″ x 26″ o/h (18″ ID). 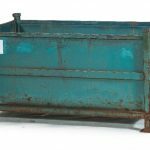 Item #834: Steel Corrugated Bins 34″ x 68″ x 30″ o/h (23″ ID), rollover. 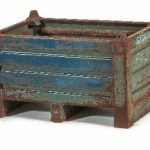 Item #826: Steel Corrugated Bins 51.75″ x 33.5″ x 28.5″ o/h (23″ ID). 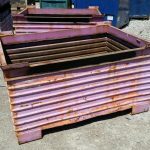 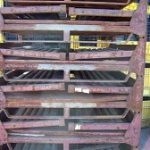 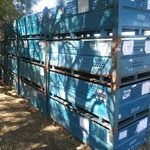 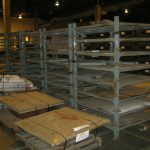 Item #755 Steel Vented Bins 36″ x 48″ x 36″ o/h (28″ ID) top stacking pins, gates, runners. 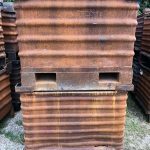 Item #589: Steel Corrugated Bins with Hairpin Stacking 27″ x 38″ x 18″ o/h (12″ ID), 24″ o/h to top of hoop.